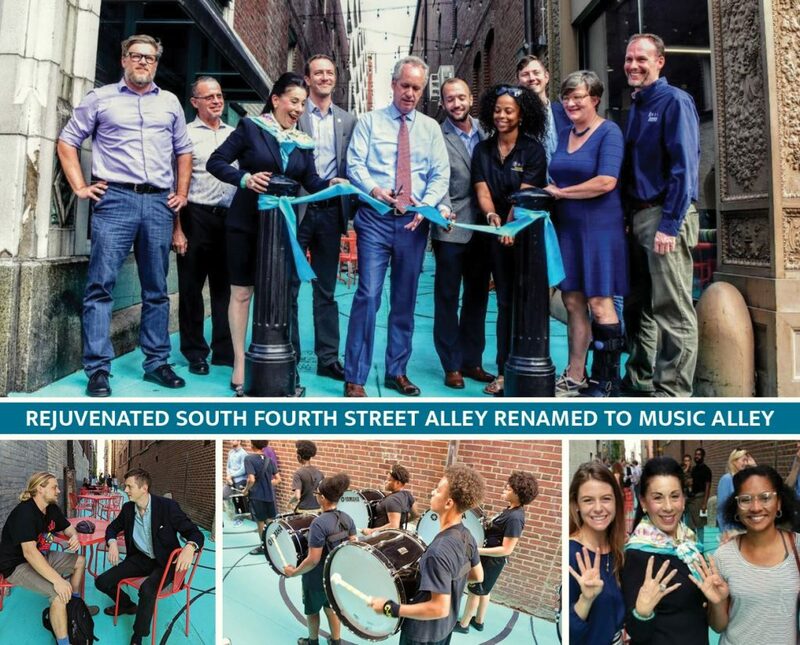 (LOUISVILLE, KY)—The alley between Mercury Ballroom and the Louisville Public Media building is Downtown Louisville’s latest example of “tactical urbanism” and was renamed today to Music Alley. 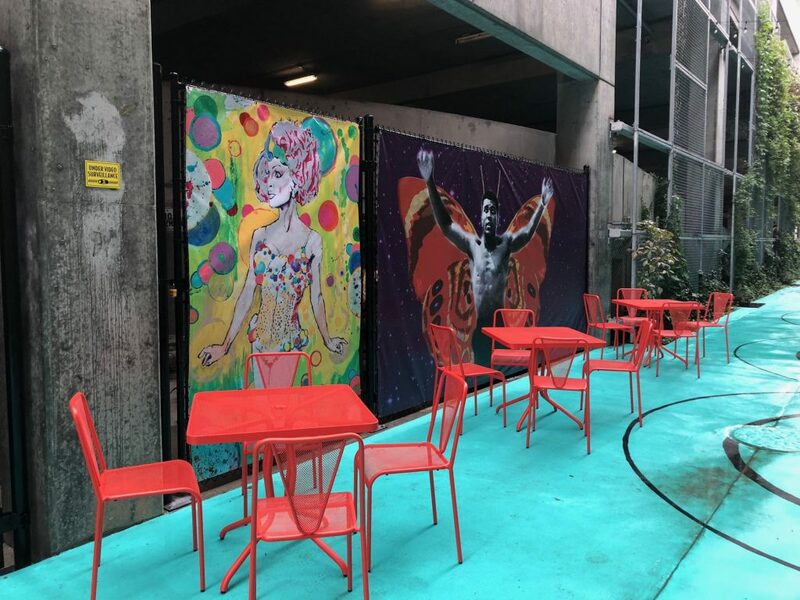 The privately owned alley recently underwent a makeover that includes all-night market lighting, painting of the concrete surface, plantings, and the addition of a fenced enclosure with Alley Gallery artwork to provide on-site storage of furniture. 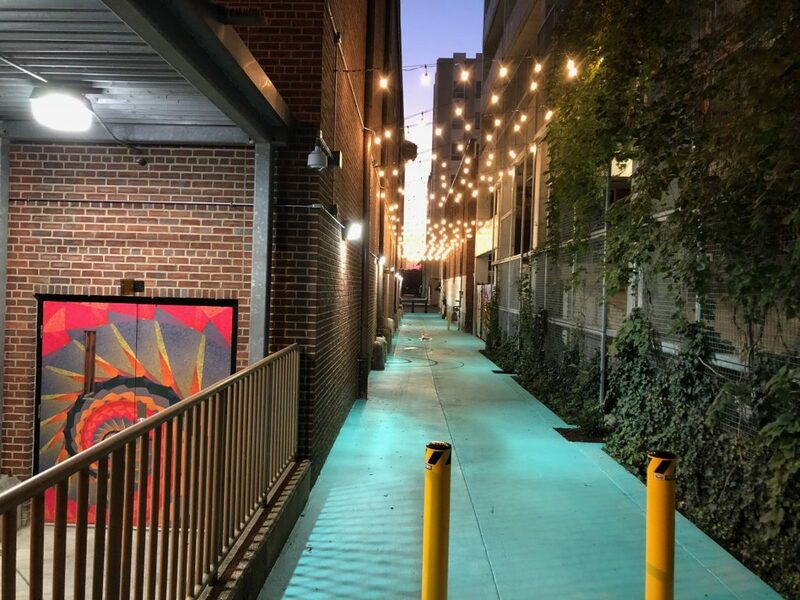 “The alley has been heavily utilized for years, but was a visually unattractive connector from Third Street for daily pedestrian use on the 600 block of South 4th Street, and for patrons waiting at the Mercury Ballroom,” said Rebecca Matheny, Executive Director of Louisville Downtown Partnership (LDP). After recent utility repairs, LDP seized an opportunity to work with the alley owners to make the improvements. 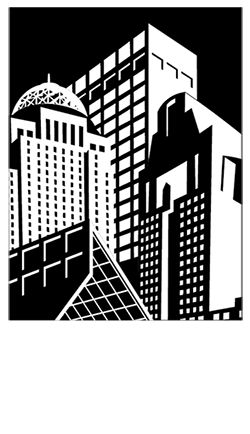 The private alley is owned by Louisville Public Media, Weyland Ventures and PARC. The owners are still developing a plan on how the alley will be utilized in the future. For now, the owners may utilize it for private events or as a comfortable space to wait for the doors to Mercury Ballroom or the Palace to open. The total cost of the makeover is $22,000 which includes $18,500 for physical improvements to the space from partner sponsors, and $3,500 from LDP for event-related furniture to be stored on site. Prior to the makeover, the alley already had four Alley Gallery doors directly on it or immediately adjacent to it. With the addition of two more, six locally-produced art works are now on display. The completed portion of the alley is the first phase of what LDP hopes are more activations and improvements to the public space.